Save time, quickly identify improvements and manage change more easily, for only $59. Looking for an easier way to manage continuous improvement? StreamLiner can revolutionise the way you manage improvements. No longer do you need numerous plans pinned to your walls! No longer do you have to try and guess the right improvement to focus on. Follow the StreamLiner system and save time and effort. You improve your team's clarity and accelerate your improvement wins. Also, if you operate a continuous improvement suggestion scheme, StreamLiner can help manage your staff's expectations. And clearly communicate the improvement idea 'leaderboard'. StreamLiner's built-in tools helps your team get straight into process analysis, even if they are inexperienced. The software takes the hassle out of continuous improvement, letting you get on with your day-to-day job. You can conduct, organise, and monitor improvement activities within your company. StreamLiner centralizes your data, enabling your colleagues to quickly access key improvement activities. Track all improvement activities for any project. Track meetings and assign actions from those meetings. Conduct Waste Walk activities and assign action items. Conduct 5S Audits and assign actions. Conduct process analysis reviews and assign actions. Analyse the process with the Cause / Concern / Counter (CCC) approach and assign actions. Track, and link, all documents for the project. Conduct audits, track and assign actions from those audits (see video below). Quickly create new projects within StreamLiner, get stuck into an improvement analysis right away. All of StreamLiner's analysis tools all you to create actions directly from the observations. Quickly monitor all of the improvement actions in one list. Rate the actions based benefits, cost, and speed (BCS) score, which lets you prioritise the actions. 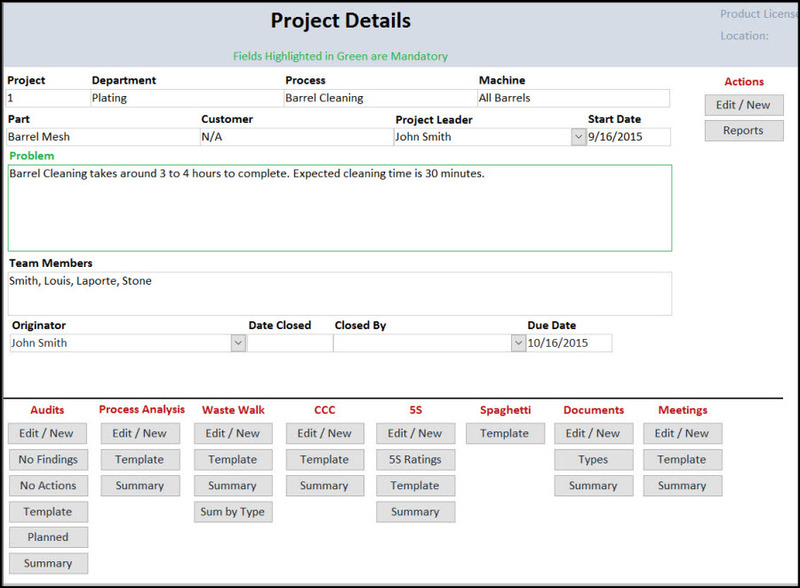 Create action lists reports by BCS, Responsible Employees, Due Date, Open and Closed. 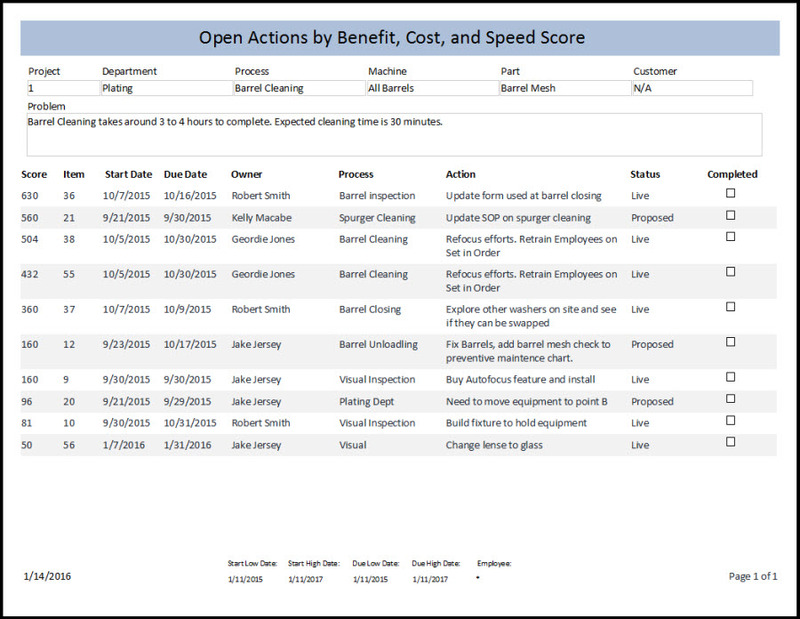 Quickly sort the actions by process, employee, due date, item, status, and BCS score. Save time by managing all of your improvement actions in one place. Use the report filters and focus your team onto the few tasks that can make all the difference. Create your own rapid audit assessment. Find out if you are where you think you are and start your improvement journey here. Find out what exactly goes on within your business processes. Discover improvement opportunities that are right under your nose! Only, you haven’t noticed them before! Use our quick print templates and get your team on a waste walk. Find the waste in your business and then rapidly create an action plan. Use the Concern, Cause, Countermeasure approach to log issues you have with the business’ operations. Springboard your way to an improvement plan. Take advantage of our built in 5S scoring sheets. Move your business teams away from mediocre to awesome workplace organisation. Orchestrate your team’s improvement activities with our meetings matrix. Log your actions directly within StreamLiner. Save time by managing all your improvement actions in one place. Use the report filters and focus your team onto critical tasks. You can tailor your Lean approach with StreamLiner. You can use all of the tools, some of the tools, or pick’n’mix. It’s whatever gives your business the improvement strategy and tactics it needs. 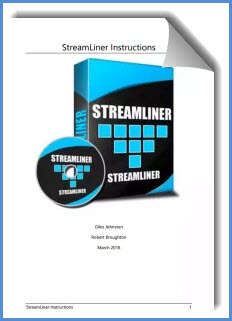 Included with your download is the StreamLiner guide. But don’t worry, StreamLiner is easy to use! If you want to have a look at the instructions before you buy - click here. 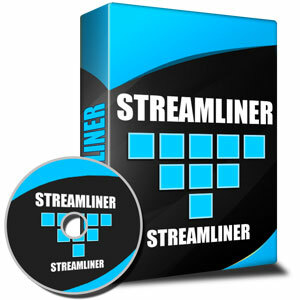 StreamLiner helps you pull together your ongoing improvement activities. It lets you comfortably manage all improvement actions. StreamLiner removes the complexity of change management, meaning your business can benefit from the results all-the-more quickly. Please pick the correct version of StreamLiner, the one which best meets your needs. After payment, you will receive an email with a link, to download the software. Please read the FAQ (Frequently Asked Questions) below if you want to use this software on more than one PC. If you have Microsoft Access (version 2003 or greater) then select this version. Get the answers to the most common StreamLiner questions here. If you do not have Microsoft Access* then please click the below 'Add to Cart' button. Microsoft Windows only. * This version has a run time license included, please do not purchase if you have Microsoft Access (2003 or later) already on your PC. Find out what other people think of StreamLiner.